Check it out, I'm famous! You can see my review of The Speicherstadt at Dice Hate Me. Thanks to Chris for the opportunity to share this review with all of his fabulous fans! If you're looking for more euro-style games, you might also check out my reviews of Caylus, Le Havre, and Tigris and Euphrates. When a game truly defines a genre, I think it is only appropriate that I give it a try. And so, I wound up buying Carcassonne. Carcassonne is the tile placing game. 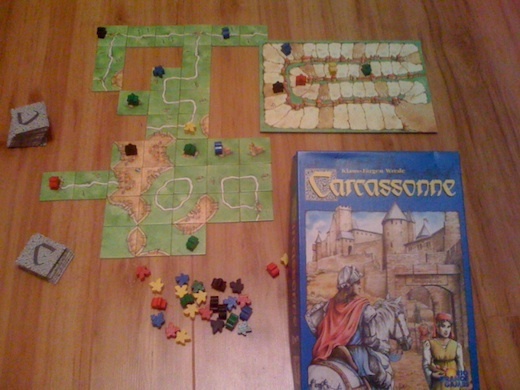 In Carcassonne, players take turns drawing and playing a tile. When playing a tile, it must be be placed in a "valid" position (which means that whatever is on the tile matches up with what is on the tiles next to it - no dead-ending roads, castles without walls, etc). After placing the tile, a player has the option of placing a meeple (yes, I believe Carcassonne also brought us meeples - wooden people shaped pieces) on the newly placed tile. 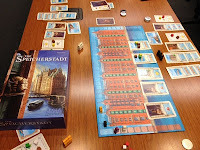 Placing meeples is where much of the strategy of the game takes place, as it is what drives the scoring of the game. Meeples can be placed on roads, farms, cloisters, and castles. 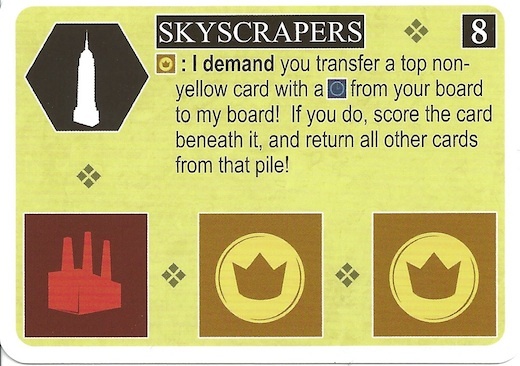 Whenever one of these things (other than a farm) is "completed" (the castle is completed, the road becomes a circle, etc) then the meeple scores points and becomes available for the user to re-place. Play continues like this until all of the tiles are placed. At this point, farmers score points, and so do all of the meeples on incomplete roads, cloisters and castles. Then, gasp, the player with the most points wins. What's good and innovative about Carcassonne? Well, we will start with innovative - the whole game is innovative (to me). I had never seen a game where the actual playing of the game is based on placing tiles. 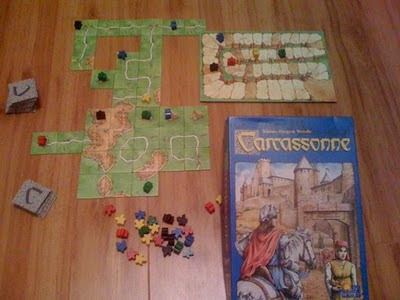 Yes, there is a possibility of games before Carcassonne being based on tile placing (feel free to tell me about them in comments), but Carcassonne still managed to define the genre, as it brought it to the gaming market in a big way. Now that I've told you that it's innovative - is it good? Well, I think that the best aspect of Carcassonne is that it is a nice, simple game. When you want to play a game but don't want to obsess about every move and debate whether it is the best strategy, Carcassonne is your game. It is easy to teach people (though I recommend not beating the snot out of them like what happened to me the first time I played), and can be played by almost anybody - gaming background or not. It is long enough to be engaging, without being so long that you get bored with it (though if you play too many expansions, you might argue that it gets too long). However, though Carcassonne is very innovative and simple... it didn't click for me. I like to say that I don't care what genre a game belongs to, as long as it does that genre very well. Tile placement may be my exception. 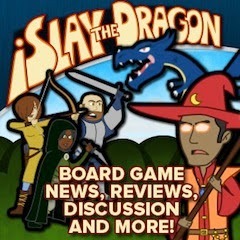 I have tried several tile placement games including Carcassonne, Alhambra, Architekton, and a few others. I haven't found any that I think of more highly than "they're ok." Carcassonne falls into this range for me. I can play it, but it's not really one of my preferred games - I would play it when friends want to play it. Now, for a more objective con, I dislike the reactive nature of Carcassonne. Each turn you must draw a tile, assess the current state of the game, and then place it. There is very little that you can do to form a continuing strategy throughout the game. No matter how well you place things, if you don't draw the correct tiles to allow you to score, there is very little that you can do. I think that this does add to the lightheartedness of the game, and indeed many people will like this. However, this isn't an aspect of games that I am particularly fond of. Overall, I give Carcassonne a 7.0/10. It is a respectable game that I understand why people enjoy. However, with that said, it appears to have defined a genre that I have discovered that I dislike. So, admittedly, I'm not a huge fan of tile laying. So, instead of only reading my biased opinion, you might also check out Board Game Family's Carcassonne review, or another Carcassonne review on Games With Two. 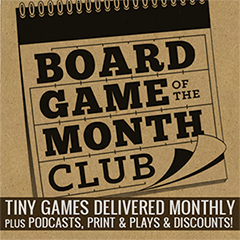 Or, if you're looking for other gateway games, you might want to check out Tsuro, Cargo Noir, Shadows Over Camelot, or 7 Wonders. So, sometimes I play incredibly complicated games, and sometimes I just relax and play something quick and easy. Something like Fastrack. In Fastrack, you and your opponent sit on opposite sides of the board, and you each start with 5 disks on your side. You also have an elastic band attached to your side of the board. Here are the complicated rules: using the elastic band, be the first player to flick all of the disks to your opponent's side of the board. Now, it's not as easy as it initially sounds - after all, there is only a small opening in the middle of the board to shoot the disks through. If you're able to shoot the disks over the middle divider, that's legal as well. Finally, if a disk shoots off the board entirely, it is out of play until the end of the round. That's it - now you know how to play. Here's the first thing that I like about Fastrack - it's incredibly kid friendly. Now, I don't have children, so I'm not always the best judge of this. However, when I went over to a friend's house, his kid was playing Slithering-Jumping-Hissing Snake (oh, you don't know the rules to that one? They're fairly simple - you have to wriggle yourself across the floor... or jump... or even walk if you're not motivated. Oh, and you can hiss at people - and you definitely want to earn style points! But, really, there's no score keeping, so those style points just make you feel better.) Anyway, where was I - ah, yes, Fastrack. So, after I arrived and the very intense Snake game ended, I asked if he wanted to play Fastrack with me - the answer was yes, and we both enjoyed playing several rounds of it until I was ready to move on to the next game; he then played with the next person... and would have continued playing except that he had to go to bed. So, yes, I would say that I have tested this and that "kid friendly" is a very valid descriptor for this game. Next, I really have enjoyed dexterity games recently. I realize that they're not for everyone, but if you're looking for something fast-paced that requires dexterity, Fastrack is a good choice. 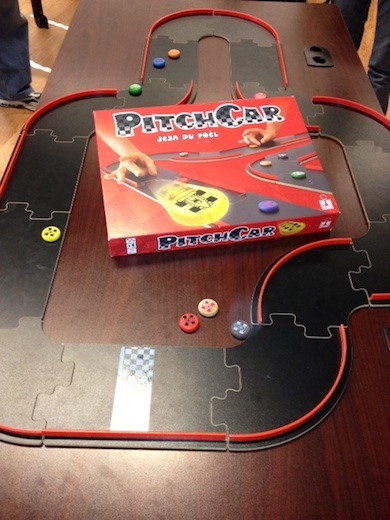 Most other dexterity games (like PitchCar) allow you to prepare for your turn and take your time, Fastrack is not like that. You have to be ready to go full speed the whole time. Now for something interesting that I hadn't thought of when I first heard about the game. How hard is it to shoot your piece through the middle? Well, not too terribly hard. However, you have to be careful with this - keep in mind, you both have elastic bands. So, if your opponent is grabbing a piece and not covering his band while you shoot a piece at him a bit too powerfully, there's a good chance that it will bounce off of his band and come back to your side. This happens to me much more often than I would like - I need to work on shooting a bit more softly. The only real "con" to the game is related to the nature of it - it is a very simple dexterity game. If you don't like dexterity games, fast-paced games, or non-strategy games, then why would you even consider playing this? 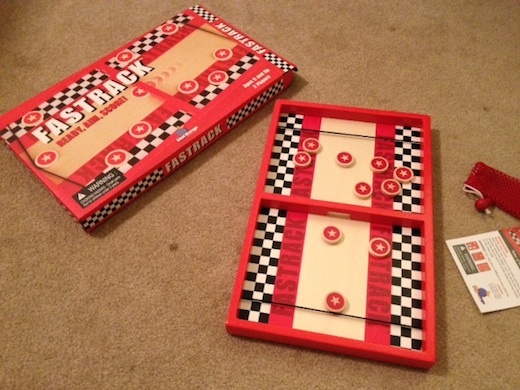 For me, I enjoy Fastrack as a diversion, but it is not the kind of game that I will spend hours at a time playing. However, I will probably break it out and play a few games of it every now and then for a change of pace - and enjoy playing it when I do so. After all, it is relatively small and light, so it will be easy to carry to a gaming event and play when I have a few extra minutes. If you want to know some other opinions on Fastrack, you might check out Games With Two's Fastrack Review, or the Board Game Family's review of Fastrack (they even have kids! ); or, if you want to read about other dexterity games, check out Crokinole, PitchCar, and Caveman Curling. I would like to thank Blue Orange Games for providing me with a review copy of Fastrack. A somewhat hotly debated board game that came out recently is Yomi. Yomi is a fairly simple fighting game. Each player takes on a character and attempts to knock out his opponent. This consists of a series of rounds in which both players will play a card and (depending on what cards are played) one player will most likely take damage. Specifically, each player chooses a card (and a side of that card) to play each round. Both reveal at the same time, and there is a Rock/Paper/Scissors style resolution. 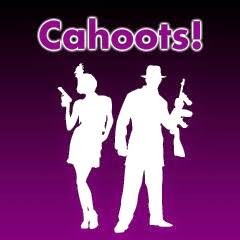 Attacks beat Throws, Throws beat Blocks & Dodges, Blocks & Dodges beat Attacks. If both players play the same type of card, then the tie is broken based on the speed of the attacks. Once a player successfully scores a hit, depending on the Attack or Throw, they will probably be able to combo that attack to score more damage. His opponent has the opportunity to counter by playing a Joker, though - or to bluff and pretend that he is playing a Joker. If the person being attacked truly played a Joker, then all of the combo damage is deflected. Otherwise, he takes all of the extra damage and loses the card he used to bluff! Finally, both players have the opportunity to "Power Up" by discarding various poker hands to retrieve Aces (each character's super moves) from the discard pile and/or deck. Play continues in this manner until one of the characters is knocked out. Now that you understand the rules of the game, it's time to discuss the crux of the game (I normally jump into pros and cons, but this is a much more topic in Yomi). The crux of the game is the Attack/Throw/Block (Rock/Paper/Scissors) mechanic. As opposed to standard Rock/Paper/Scissors, in Yomi you aren't just guessing at what the other person will play. You know enough information that you will be thinking, re-thinking, and over-thinking the situation. Each character has a different breakdown of cards in their deck (with a cheat sheet on their character card telling you this breakdown on a 0-5 scale). Therefore, you know if your opponent is more likely to have Attacks, Throws, Blocks, or Dodges. You also may know if they have a Block (if they have successfully Blocked previously). You also might know if they have some Aces, and if you paid attention, you'll know how that Ace can be played. But you also know that they know all of this. Therefore, the game of Yomi is truly a battle of wits against your opponent as you both try to stay one step ahead of each other as you try to outwit one another. If you like this type of mechanic, then you will absolutely love Yomi. If this sounds like something that you are uninterested in, then you should definitely stay away. The first pro that I have found in Yomi is the different characters. This game could mechanically work with a standard deck of playing cards (where you make each suit a certain type of move), but it would have no flavor. Instead, with the characters, the differences in decks, and the different breakdown of moves, you truly get the feel that each character has a unique style that you need to embrace in order to win. Along the lines of theme, the next pro that I have for Yomi is that I really enjoy the artwork. Whereas I don't often care much about the components in games (unless they are really good or really bad), I found the art in Yomi to be a definite highlight of the game. Next, I really liked the fact that each card was double sided. This essentially doubles the possible plays that you have available. This is critical as you are trying to stay one step ahead of your opponent. If all of your cards were one-sided, then you would be more likely to guess what your opponent is going to play based on how many cards they have in their hand. 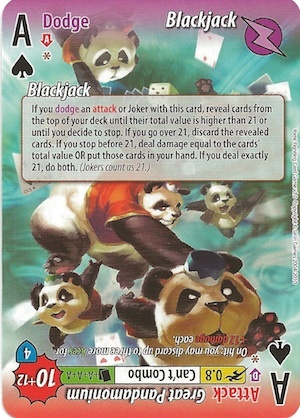 However, with the double-sided cards, you are almost guaranteed that they at least have a chance of countering whatever card you are going to play. When playing Yomi, however, I found that I was often frustrated by not having my deck "flow" well. I will freely admit that I have not played Yomi to the point where I consider myself a master at the game, and so this con may go away with continued play. However, I often found myself short on cards, which makes comboing and powering up very difficult (these actions both require several cards to perform). Without being able to combo, you are not able to hit your opponent for more than a few points each turn, which in turn leads to the pace of the game being much slower. Now, Blocks allow you to draw extra cards, so if you are very good at picking the right time to play a Block, you may not suffer from this problem - but it was frustrating in the games that I played. My other con is really just a confession - I was not in love with the Attack/Throw/Block mechanic. 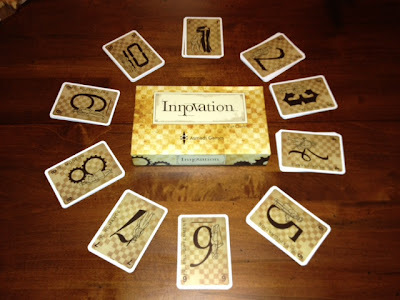 I think that it works, but it wasn't something that captured my imagination and made me want to keep playing it. Since this is the crux of the game, you can imagine that the game didn't really click very well for me. Overall, I give Yomi a 7.5/10. Even without being enamored with the key mechanic, I thought that it functioned well enough to give it a respectable score. The closest comparison that I know of is BattleCON, which I also gave a 7.5 to; however, in a direct comparison, I believe that Yomi would score the victory. At $100 for the complete Yomi set, I would highly recommend trying out a friend's copy or buying some of the smaller sets before investing in buying the complete set. Want some more opinions? 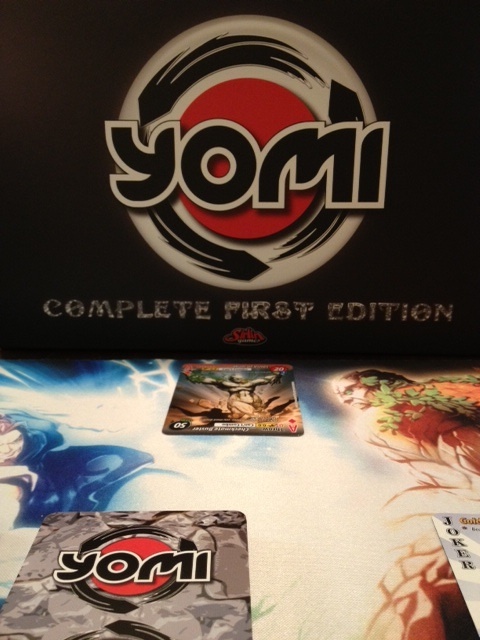 You can read a review of Yomi at Play Board Games, or another , or another Yomi review at Games With Two. I would like to thank Sirlin Games for providing me with a review copy of Yomi. A nice little two-player game that one of my friends introduced to me was Babel . For the first pro in Babel, I really liked the different races and their powers. Granted, I have not played this game enough to determine if one power seems "better" than any of the others, but in the games that we have played, each race's power had times in which it was crucially important. The Persians (which let you skip a level when building your temple) I initially thought were the weakest of the powers, but I used them to secure victory in one of the games! Some of the other powers are much more directly offensive (one of them lets you rob the top level of your opponent's temple, another lets you "emigrate" (kill) their troops), but finding the correct time to use your powers, while preventing your opponent from capitalizing on his (and maintaining enough units to actually build temples!) 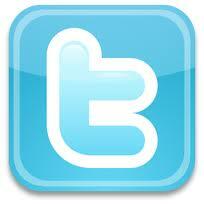 is the crux of the game. The next major pro for Babel is simply what the game itself is - it is a fairly quick, somewhat deep, easy to learn two-player strategy game. There are some of these available (I think this was actually part of a product line several years ago of two player games). However, none of the other ones that I played from that group seemed to actually gel as well as Babel does. It claims to be 45-60 minutes, but I would think that around 30 minutes would be a bit more realistic. To actually learn the game from the rules takes about 15-30 minutes, and to teach it takes about 5 minutes. And yet, while playing the game, you feel like you're actually engaged in a strategic experience where one person legitimately wins primarily based on skill (and there's enough depth to it that the game won't be "mastered" after a couple of plays through). And, to go with all of that, the box is also compact enough that it could pretty easily be slipped into a backpack to be played at a coffee shop or, better yet, at an airport! (Yes, I'm back to really liking games that can be played at airports.) Setup time is incredibly short, and so it is an ideal game for these kinds of situations. When it comes to cons for Babel, nothing truly jumps out to me like in many other games. That by no means is the same as saying the game is flawless. It simply means that its cons seem more nuanced. For example, I have questions about the replayability of the game. Whereas I have enjoyed my plays of it, I'm not really certain that it will be a game that I will really think "I really need to play that" about, nor was I immediately motivated to start a new game after completing the previous one. I definitely wouldn't go out of my way to get a game of it in. I think this really starts relegating it to the filler category - something that you play because you want to play a game, and often that you're playing while waiting for a different game to be played (such as if several people in your gaming group are regularly late). Overall, I give Babel an 8.0/10. I debated between a 7.5 and an 8.0, really thinking that this one isn't quite as good as Hive (which I also scored at 8.0). Eventually, I determined that I think I simply should have given Hive a higher score, as this one seems to fit in perfectly at 8.0 I think that it is a solid game, and would truly be ideal for someone looking for a game that they can carry around with them and teach whomever might be interested in gaming. 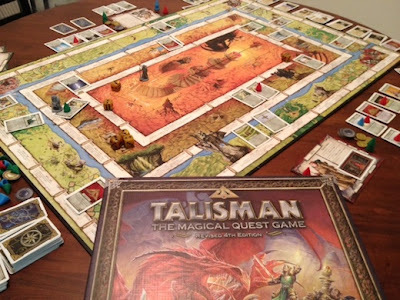 So, after hearing mixed reviews for a long time, I was finally able to play several games of Talisman: The Magical Quest Game, Revised 4th edition. In Talisman, each player takes on the role of a generic person of a given type (Sorceress, Thief, Wizard, etc). From here, he must wander around the board fighting monsters and encountering strange phenomena until he is able to strengthen himself enough to go to the Crown of Command and then start killing off all of the other players (in the Crown of Command he gets a magical spell that lets him kill them from where he is without chasing them). On any given turn, the active player will roll a six-sided die and will then have to move that many places around the board in either direction. Once he finishes movement, he will encounter whatever is already there (if anything), or he might draw a new encounter card (or cards) as directed by the game space (or he may even try to fight another player if one is present). Once the encounter is resolved, his turn is over and the next person repeats the process. This continues until one person quests all the way into the Crown of Command (which requires a Talisman (hence the name "Talisman") to get into) and destroys all of his opponents (who are glaring at him for shooting them). Talisman is a conundrum to me, and so this section about pros and cons may seem a little bit different than normal. For example, here is the first conundrum: Talisman felt like a lightweight game to me, and yet seems to average around an hour per player. By "lightweight", I mean that there are not a lot of stats that have to be kept track of, and combat is really pretty simple (compare your stat plus a six-sided die roll to the opponent's stat plus a six-sided die roll). It is a very quick paced game in which the time between each of your turns is only about a minute or two, even in five player. And yet, with this, the game can still take a long time to play (this is not as much true in two player, but even still the "short version" of the game where you only have to enter the Crown of Command (not kill everyone else) will take about one and a half hours). Because of that, I don't know that I can easily fit it into either the category of lightweight or heavy. One of the pros for Talisman is that, since it feels lightweight, it allows for social interaction during a game. To me, Talisman is a game that I can play when I am really wanting to hang out with people but I don't really know what I want to do - we can talk and enjoy each other's company, but we can also be throwing dice and playing a game. In this same vein, it is also a game that I could see myself playing on a Saturday afternoon while watching baseball on the TV (yes, I like baseball), and the learning curve of the game is small enough that almost anybody could learn the rules and play it with you (though they might rudely make fun of our hobby, but that's a different discussion). Yet, with the small learning curve, there are still a few random rules that are easy to forget - like how many spells you are able to hold based on your craft; see, it's a conundrum. The main unique pro that I have for Talisman is the concept of fate tokens. How many times have you made the worst possible roll of the dice at the most critical moment? For me, that seems to be the inevitable time that I will fail any given die roll. That's where fate tokens come into play. Each player starts with some fate tokens (based on their character) and you can use a fate token to re-roll a single die (only one that you have rolled on your turn - not one that was rolled against another player, and not one that was rolled against you). You have to keep the result (even if you're like me and roll the same number again). You can use this to re-roll for movement, battle, or encountering a location. This really helps you to avoid being turned into a Toad.... which can happen. 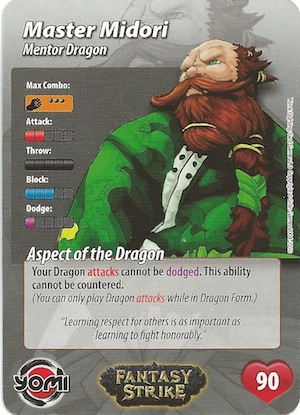 (There are even special cards and figures for Toads - four of them, for in case lots of players are turned into Toads!) I've not seen anything like fate tokens in any other game, and I think that it is a great mechanic. One thing that is noteworthy about Talisman but I both like and dislike is this: your character can actually die in Talisman. Whereas in games like Runebound, your character is "knocked out" (and you only lose an item or a few turns), in Talisman, if your character dies you get a new character and you have to start over. I thought that this was interesting and forced players to be much more careful about their life total. With that said, however, if someone dies after a few hours of the game, I personally would prefer that they were eliminated; realistically at that point they aren't going to win either way. My second point of note is that Talisman is built to have player interaction. Whereas you can play Runebound (and many other games) as a race to see who can kill the big bad voodoo monster first, Talisman really pushes you towards fighting each other. There are several spells that affect other players, characters who have abilities that let you steal from other players, and even encounters that will affect the other players - in fact, in order to win, you have to kill everyone else! Many people will love this part of the game (they probably actually did player versus player combat in Runebound!) but some would prefer that this aspect of the game was a bit less emphasized. I just thought you would want to know about it up front. One thing that I didn't like about Talisman is how the encounters were setup. The entire time you are playing the game, you are drawing from the same pool of encounter cards; the way that challenges become more difficult is that you either experience more of them at once or the board causes their traits to be somewhat higher. This setup does not allow for characters to experience monsters that are the appropriate level for their character - you are just as likely to experience a strength 7 dragon when you just start the game as you are to experience a pool of life that replenishes you or a strength 1 wild boar (which in the middle might get a plus two to be a strength 3 wild boar) when you are getting close to the final boss. What's more, in the base game of Talisman, there are far too many "useful" (or net no-gain) encounters. From the times I've played, it seems like there are twice as many items that you might find than there are monsters to fight. So, you might purposefully go to the locations that force you to encounter several cards, just to see what all you can draw (and hope that you don't run into one of the 2-3 dragons). I wish that there were several decks in the game - one corresponding to each region of the board. Another thing to note that I don't consider a pro or con is movement. I had heard about the movement of the game for a long time before playing it - how awful rolling the six-sided die was. Whereas, I definitely don't like the movement system as well as I do in Runebound, I did not feel like it detracted from the game. Yes, there were times that I wish I could have rolled differently, but since you are able to have an encounter on every space that you land on (as opposed to only certain ones with encounter markers), the way that the movement works doesn't really help or hinder the overall game play. Overall, I give Talisman an 8.5/10. I would be willing to play it some more, and I mainly envision playing it while hanging out with good friends and/or watching baseball. One of the most widely discussed games (whether positive or negative) of 2011 is Quarriors. "Quarriors is Dominion with dice." That is how I was first told about the game, and I can't think of a better way of describing it myself. 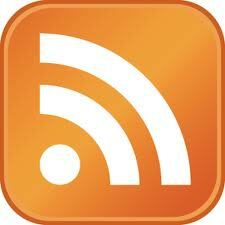 (See here for my Dominion review - one of the first reviews I wrote on this site!) 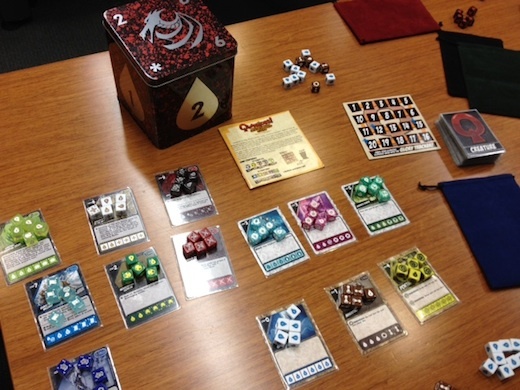 In Quarriors, each player starts with 12 basic dice. Each turn, they draw six dice from their bag (and if their bag is empty, they return the discarded dice into their bag and continue drawing). After this, they roll all of their dice, which can cast spells, provide potential creatures, or produce "Quiddity" (money). After rolling the dice, you can summon any creatures that you rolled (they each have a Quiddity cost to summon), and you can buy one new die from the common area. After this, all of your creatures attack all of your opponents - you calculate your total attack value and your opponent sacrifices creatures until he is able to absorb all of the damage. Then, your turn is over. To start your next turn, if you have any creatures still alive, they score "Glory" points. The first player to a certain amount of Glory (based on the number of players in the game) is the winner. I believe that the game can also end once a certain number of dice piles are empty, but this has never occurred in a game that I have played, so I'm not sure how many piles it is. My absolute favorite part of Quarriors is the replayability inherent in the game because of how the dice are setup. You have sets of five dice, but then you have three different cards that represent what those dice might be. Yes, each of the cards representing a given set of dice are very similar, but they still change up the game enough to give it some extra diversity. For example, the die representing a wizard may be a wizard that will give you extra glory when scoring, or he may allow you to cull dice from your bag. He may have a special ability that lets you re-roll him and get an extra die from the bag - it all depends on which card is representing that die in any given game. And, each of these different wizards has a scaled cost based on their abilities, so it actually allows some of them to be better than others (instead of all wizards are equal, but simply slightly different). However, though Quarriors definitely has some positive aspects, there are some things you should be aware of. First of all, the game is incredibly random. Did you think that Dominion wasn't random enough through all of your shuffling and drawing cards? You also wished that there was a chance that your card didn't work as you wanted it to any given time that you play it? Then you would like Quarriors. The game can be incredibly fun or incredibly frustrating, all depending on how you roll. For example, that sweet dragon that I mentioned can be incredibly powerful if you roll the correct side of the die... or it can miss completely and give you Quiddity. This can be good, since there is a chance that all of the dice you draw are creatures, and you will need at least some Quiddity to play them; but it's normally frustrating. This element of the game isn't really a pro or con - it is really just the crux of the game, and you need to determine if that is something that you would enjoy. My first con with Quarriors is that I don't feel like you are ever able to make a good "deck" (bag of dice). In most <whatever> building games, you have ways of getting rid of the start cards/dice, thus making your deck better. This isn't really the case with Quarriors. Yes, there is at least one creature that allows you to cull dice, but most games you will simply be attempting to make your die bag better by adding more powerful dice to it, not by upgrading what you have. This makes early turns more boring as you may be forced to debate on whether it is even worth it to buy the die that you can afford. The other con that I have for Quarriors was that it felt like my purchases were a bit too prescribed. For example, the creatures are all costed well enough that 9 times out of 10 the creature that costs 7 Quiddity is better than the creature that costs 6 Quiddity. Therefore, most turns consist of rolling all of your dice and then looking to see what die costs the correct amount of Quiddity for what you rolled. What's worse, most of the Creatures that cost less than 5 Quiddity are worthless (in comparison to everything else), so there is very little reason to clutter up your die bag with them. Whereas other "building games" have things that you can purchase that are mid-range in cost, but helpful long term (like the Village in Dominion), I didn't really get that impression with Quarriors. There are very few mid-range cards that actually make your die bag better, which makes you feel like you don't ever have a "good" bag of dice. Overall, I give Quarriors a 7.0/10. I think that this game can be fun to play with the right group, but that group needs to appreciate lightweight, highly random games. If you enjoy deep strategy and having lots of control over your actions, Quarriors isn't really a game that I think you will enjoy. If you want to explore more games, you might also check out Dixit, Hanabi, and Smash Up. EDIT: Since originally posting this review, it has been pointed out to me that I missed a rule. Whenever you score glory for one of your monsters, you are able to "cull" (remove) one of the dice from your used pile. This would definitely help address my first con, but I do not believe that this rule would make a big enough impact on the game to where you would ever feel like you had a "good" bag of dice. Specifically, in 4 player, you very infrequently score monsters (because everyone else kills them), and will probably only score a few monsters before winning (only the big monsters are likely to live long enough to score). In 2-player, I can see this being a much more important addition. Thank you to those of you who pointed this out to me, so that I can play it correctly from now on! So recently I have been debating what I want to do with this site. I enjoy writing reviews, and I still intend for that to be the bulk of my posts. However, one thing that I've heard from some of my readers is that they like when I compare games to each other. Also, I got to spend some time with Jason from Play Board Games recently, and he encouraged me to start writing "Top Ten" lists - he said that they're both fun to write and engaging to readers. So, why not? Feel free to add comments to my Top Ten, missed games, and whether you like the addition of Top Tens to the site! Top Ten Abstract Strategy Games!! Simple but enjoyable. This may be the only abstract strategy game that I know of that can support up to 8 players! Gorgeous and engaging. This game is perfect for anyone with children, but the amount of luck involved in your initial setup keeps it from placing higher. This is basically sumo wrestling as an abstract strategy game. It can be incredible fun, but can also become tedious if you and your opponent are too experienced at it, if you are both able to avoid getting any pieces knocked off the board. One of my surprise finds of 2011 was Jin Li. Having never heard of the game before I was given a copy, I quickly fell in love. Surprising depth with very brief rules, I wound up buying the iPhone version so that I could play it when I needed a 3-minute break. One of my very first reviews, Hive is the game on this list closest to having a theme, but it's paper thinness allows it to still land on the list. Simply a brilliant game (another one that I've bought for my iPhone) of attempting to surround your opponent's queen. The Gipf project finally cracks the list with what many believe to be the best game in the series. Unfortunately, it's up against some brilliant competition both from other games in the Gipf project, and some outsiders. Still, Yinsh combines some beautiful gameplay elements to make for a great experience! 4. Hey, That's My Fish! A game that can be enjoyed by everyone, I would recommend that everyone buy a copy of Hey, That's My Fish since you can currently buy it for around $12 from Fantasy Flight. The setup time (especially in comparison to the actual gameplay time) is the biggest downside, which is why I have converted most of my time with this game to playing it on the iPad. However, anyone with children take note - this is a great game that you can play with kids, and I've played it with kids as young as 4, who were still able to understand and enjoy the game. Mindtwister USA's flagship game really is a prototypical example of what I look for in an abstract strategy game - easy to teach, easy to transport, and many levels of strategic depth. "Play one, twist one, try to get five in a row." It's much deeper than it initially appears. A game that I gave a score of 8.5 to tops the list? Yeah - I always say to read the text and not to focus on scores, and this is a perfect example. I love Dvonn. Love it. What's more, the setup and the teardown of the game are the game allowing for essentially no downtime with either of these activities. Some people disagree, but I think that the ever-collapsing board makes for a great play experience! Rise, Tzaar, Ingenious, Multiplayer Pentago, Cityscape. Any of these could have easily made the list, as they are all solid titles, but the real question would be - what do I take off of it in their place?